Homemade pork tamales are a special occasion food to prepare. First make the pork filling in the pressure cooker using pork shoulder and a variety of chile peppers. Then make the masa dough. 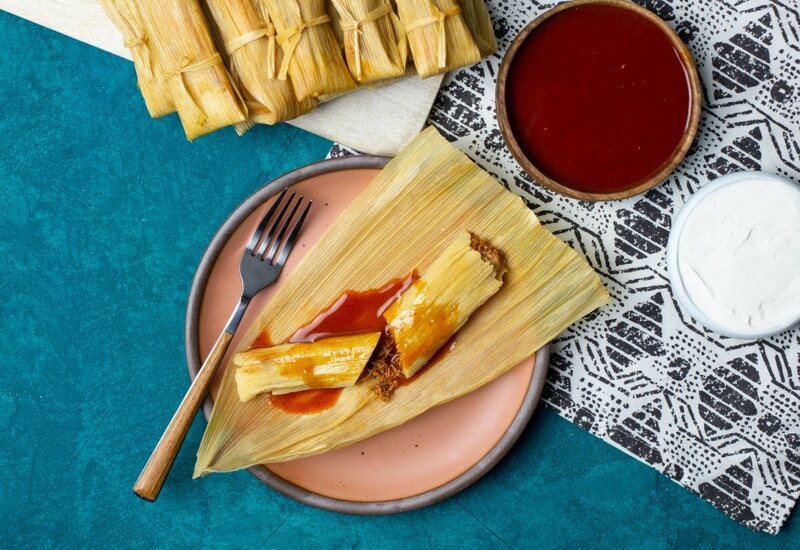 Fill the corn husks and cook the tamales in the pressure cooker for 45 minutes for perfectly tender and moist tamales. Serve for breakfast, lunch, or dinner! You can use chicken in place of the pork, if desired. Tamales freeze well too. After assembling the tamales, place any extras in a freezer bag and freeze. Then cook them in the pressure cooker for 45 minutes when you are ready. Per Serving: 270 calories; 14g fat; 27.4g carbohydrates; 13g protein; 37mg cholesterol; 210mg sodium. These are labor intensive for sure, but the end result is rewarding. The filling was flavorful and this makes a TON! I have frozen quite a few and grab some from time to time to snack on when I don't really feel like cooking.